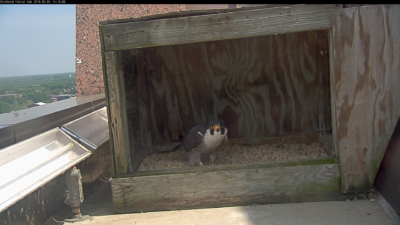 DGIF received a report this week from the Center for Conservation Biology (CCB) that last year’s breeding female from Richmond is now paired with a male in Yorktown. CCB Director, Bryan Watts, caught this dramatic photo of the female while banding the Yorktown brood and noted that her bands (70/AV) matched that of last year’s breeding female in Richmond. Richmond male stands outside the nestbox on May 7th. Meanwhile, the Richmond male remains a bachelor. His second courtship attempt this season appears to have been unsuccessful. The female with the “heavy hood” that he was seen courting on camera on Sunday, April 22nd has not been spotted again since. A DGIF biologist explored downtown Richmond yesterday morning, May 9, to investigate. He did not observe nests or signs of the pair’s presence at any of the prior nesting locations. Nor did he observe any signs that the second female was still around. Despite the male’s two failed courtship attempts, he remains loyal to his territory around the Riverfront Plaza building. We’ve continued to see him on camera at the Riverfront Plaza building nearly every day. He even regularly heads inside the nestbox to work on a scrape (a shallow bowl in the substrate that forms a nest). Oftentimes, when he is out of site, he is perched on top of the camera itself, out of our view. 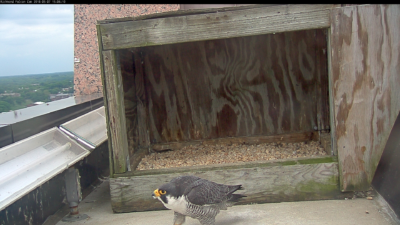 The male seems to be using the top of the camera and the top of the nestbox as perches from which to hunt. Our DGIF biologist noted two prey items (parts of a Northern Flicker and a Yellow-billed Cuckoo) on the parking deck across the street from the Riverfront Plaza building nest box. Richmond male standing in the scrape on May 4th. Richmond male working on the scrape on May 4th. As the clock continues to tick on this breeding season, we continue to hope the male may yet find his mate. The latest the Richmond pair has ever laid an egg was on May 24th in 2009, so there is still time for the male to pair up and breed if he can find another female wandering across the landscape, but time is running short. 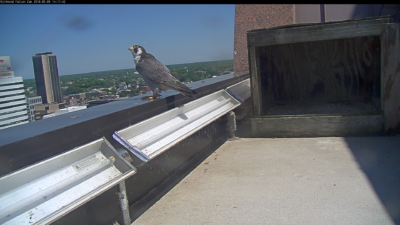 Richmond male on the parapet of the Riverfront Plaza building on May 9th.